June was a big month around here. We released my new book, Cultivate, and I’m so grateful. But, I have to tell you that, ever since the release last Tuesday, I’ve been mulling over some new thoughts. My favorite spot in the garden right now. I’m still processing all of this, but yesterday, Emily, Amber, and Kristin encouraged me to share what feels undone and imperfect–to share my journey in the in-between. For the last five years (five years), I’ve had a book deadline looming. I began writing Make it Happen in October 2013. A few weeks after Make it Happen released, we started talking about book two, which was originally titled Move Forward … until life moved forward in a completely new direction. For the last five years, my daily life and thoughts have been shaped by the rhythm of surrendering my story to be told in words and living out what became these two books. This has been a time of sometimes-fast growth–in great ways and stretching ways. It’s a funny thing to constantly be crystallizing thoughts and lessons as you’re in the middle of learning them. It causes you to really let the lessons sink in, and that causes change. Heart change. Life change. Lots of change that I am grateful for! So much has happened, and I sit here feeling the need to stop–even just for a moment to let the changes of the last years–and the last week even–sink in a little deeper. Pressing flowers from the garden with Grace this week. In the last week, as I’ve taken a step back from social media and teaching, I see my life being cultivated in deeper ways than ever. I feel a new story is happening. A few favorite photographs from June: picking blueberries at Wanda’s (she was so happy when I brought her a book with her story inside! ), pressing flowers from the garden, my dear friends Kristy and Ruth who came to babysit the kids during the Cultivate book launch party, and my friend Renee came to visit with her sweet family. The roots of my faith have begun reaching deeper–and this has happened in unexpected ways. We’ve experienced some spiritual warfare in our marriage lately. We haven’t had any fights or anything like that (in fact we’ve had some really great date nights lately! ), but Ari and I have both had dreams about the days when our marriage was a mess. These dreams have been a strong reminder to us both to put on our armor and double down on our faith together. My desire to cultivate good things in the hearts of my children is constantly on my mind and I’ve found a new joy with each of them in the last weeks–specifically this week. I have found a new confidence in leading my team that has come from vulnerability and learning to steward well what the Lord has entrusted me with. And this last week, in particular, has shown me what it means to trust God’s power to make something grow where there seemed to be nothing. Problems that had no solution in sight and felt impossible to solve, were solved in ways I couldn’t have imagined. I don’t share this without specific details to be cryptic, but there have been so many instances, that it would take me a dozen more paragraphs to name them. God can make the impossible happen. I know all of these thoughts may seem scattered, but I believe something is happening in my heart. I’ve been deep in the garden, in the dirt, in the thick of pruning and tending and sowing and growing, and now I’m starting to step away and see what He grew. And stepping back to see the big picture motivates me to get into the dirt and dig in even more. Thank you for letting me share my heart with you. I’ll keep you posted as I continue to let these new thoughts unravel. I’m grateful for this little space and the gift of words shared with friends. – Delilah chose Cultivate as her July book club pick. So fun! – I chatted with Leah from Faithzette about how living an intentional life isn’t about following a set of rules. Huge thanks to many friends who have shared about the book and how it is encouraging you. I am so grateful! – Pray impossible prayers and be open. Yes, I made this a priority and, as referenced above, I saw God move so much more. It’s not that God moved more because of my prayers, but I noticed Him more because of a deeper awareness and connection with Him. – Steward our budget well and passionately. I don’t feel 100% solid here yet, but Ari and I had a conversation about our long-term goals and set some things in motion. Our main goal right now is to work hard to pay off our mortgage in similar ways to what Emily is doing. – Hire our new caregiver. Yes! This happened on Monday morning and we are incredibly grateful. After interviewing dozens of women from all across the country, the Lord led us to choose the very last person we interviewed… who just happened to be literally across the world during our FaceTime call on Sunday morning. After a couple long emails and a ten-minute chat, we knew she was the one — which really means that after close to a hundred hours of interviewing, discussing, and praying over candidates, it was made clear that she was a perfect fit. Pretty amazing. – Write a homeschool “starting” plan. I haven’t written anything official yet, but I did make major progress here. I had long conversations with four wise homeschooling women and filled pages and pages with notes. I feel so much more peace about what’s ahead! – Grow closer to our family group. We weren’t able to meet in June — summer is tough with lots of people out of town, but we did see several family group brothers and sisters at other events which was wonderful. We are getting together as a group this Saturday here at our house. – Solidify new team roles and rhythms. Yes. We took a three-hour chunk of time to create out Company Operating Manual and have made significant progress here. We are even introducing you to one of our new team members on Monday! Stay tuned here. – Bible journaling with Grace. – Yes! This has been fun and fruitful. Here are my tips on Bible journaling with kids. – Writing in the margins of the Bible to Grace. (More about this in Chapter 10 of Cultivate. : ) ) – Yes, and I hope to write her a note tonight after she goes to sleep too. – Love others as I have been loved–lavishly! – I can’t take credit for this one. There have been many situations in the last month in which I felt the Holy Spirit leading my reactions to challenges that arose, and in relying on Him, I was able to love others in ways I couldn’t have without His help. – Stretch my perceived limits to grow strength and endurance in my fitness. Yes, I have chosen one day each week to really push my limits in exercise and I am grateful for how that hard work is making me feel. I don’t love doing it each time, but I’m grateful after… and I know the little steps now will add up in the big picture. June daily goals: – Yes to all of these. I have made progress and love these daily goals! – Continue reading my chronological Bible reading plan for my Number 1 goal! – Stay active in my work days —see how I do it here! – Prepare for the fall (for the homeschool transition and our Write the Word and 2018 PowerSheets releases coming soon). August is typically the month where the looming back-to-school transition makes everyone feel like they must finish one million projects. I am not going to do that, so I am diligently working to prepare well now. – Praise Him out loud! Your turn! I’d love to hear: Do you have goals for July? I’ll pick one of you to send a special surprise box of goodies to from the Cultivate What Matters shop. I love sending real mail, and I love hearing your thoughts! Congrats to June’s winner, Nia Baucke! Please add me to your email alert list. Just added you, Margaret! You’ll have to approve it on your end in the confirmation email that just went to your inbox. Happy to have you! Thank you for sharing, Lara. I have been missing your Instagram stories this week, but I knew you were probably just enjoying a break after all of your hard work to launch cultivate! I continue to be inspired by you, especially to look to God’s word first in life. Thank you, Karlie! I’m grateful for you! Thank you for sharing your heart. I can only imagine how difficult it is to provide the world a window into your life- sharing successes and challenges- all while it continues to be a work in progress! It’s a lot easier to share things in hindsight, when things feel neatly packaged up and the lessons have been learned, but are they ever really? Every day on this earth is a journey toward the real destination- it’s all one big work in progress! Your encouragement means so much. So true. Thank you! And enjoy this month! I love hearing the scattered thoughts. I feel the same lately too – without the book release! I’m trying to keep July simple. Fun easy spontaneous plans with my children, throwing a baby shower for a dear friend, and slowly starting a workout regimen. I also have to get a She Reads Truth bible soon! Your June giveaway was so inspiring! Yes to SIMPLE! : ) And I’m grateful the Bible journaling post encouraged you! Spoiler alert – Illustrated Faith is having a big sale on Monday the 10th. Hey! Thank you for the book ideas! I like the sounds of What’s Best Next. Of course I am already reading through Cultivate. I think it is an interesting question to ponder: what feels undone. I guess we are always pursuing “done” but does it occur? Thank you for sharing your heart and goals because I always feel inspired by your encouragement and pursuits. I’m so grateful you’ve been encouraged, Katie! Good for you taking the time off that you need. I’ve yet to learn the art of self-care. My goal for July is to try and find myself again. I have felt so broken for the last two years, and I hope it’s time to try and put me back together. Looking forward to your return already! Prayed for you just now, Amanda. Little steps add up. So much love for you! My goals for July include turning my life over to Christ more, using my talents, and lifting in sisterhood. I love how you phrase things!! Steward finances is perfect and really gets at the point more than “keep on budget.” I also love how you bring the spiritual into everything — even money. It’s all so inspiring! Have you ever had a downloadable version of the Power Sheets?? Or is it the hard copy only? I stumbled about the word “powersheet” and your book “Cultivate” here on Instagram and I am very grateful. I am very inspired and cannot wait for the 2018 powersheets to be released. I am all new to goal setting so I ferl challenged by your June and July goals. Thank you so much for sharing them as they keep me on my toes. Anyway I am so glad to have found your site and I wish you all the best for your future endeavours from Paris, France. These rare all wonderful goals, Lara! And I adore the photos of you and your sweet family. I will pray for you and Ari! * Sell books at Half Price Books–done! *Cultivate Giveaway on my blog–this kicks off on Monday! Yay!!!! I’ m so excited to do this! *Clean out the downstairs closet–DONEEE! So happy about this! I work in a family business in an industry of mostly men. When I first used powersheets I think they thought it was just a colorful wait to write things down BUT now when I break out my powersheets at our planning meetings everyone loves to see our progress because we never had a way of tracking it before and it’s so wonderful to measure and reflect! This month, ive decided to make sure to add at least two goals, weekly and daily that are focused on my own family and personal health. It’s a big shift for me to write those things down but I’m so looking forward to it. Thank you for sharing your heart and always encouraging others! Thank you so much dor sharing your thoughts Lara! They are such an encouragement. God truly knows what we need and when. I desperately needed to hear “little by little”. I am so thankful He led me to your ministry(that is what I am calling it!). I pray His hedge around you, your marriage and family as you continue to follow His plan. 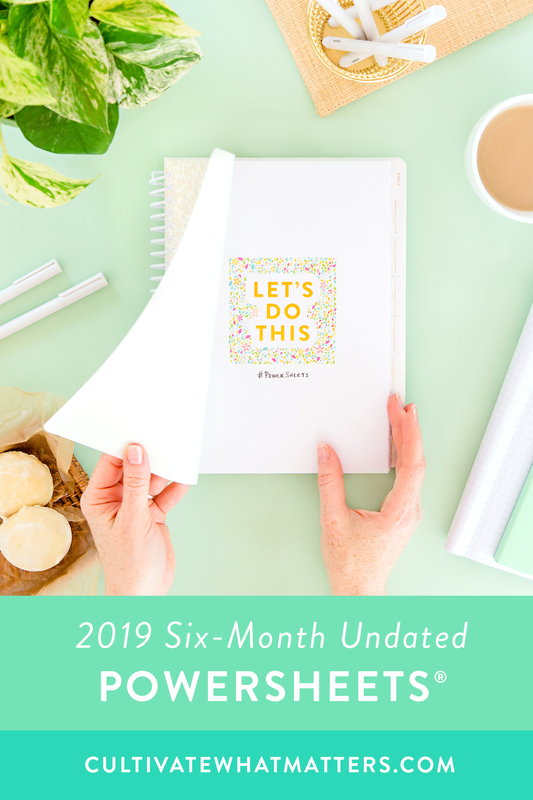 My July goals include organizing our home (just moved in), reading two business books, and making daily time with my three loves: Jesus, my husband, and son. God bless! Lara, thank you for sharing so candidly. Your monthly July goal : Pray impossible prayers and be open, hit me as a word from Lord. I am overwhelmed and praying the impossible is what I need to be doing. Thank you for sharing your story and love for God. Life happened, so I haven’t done July’s PowerSheets yet, but I know one goal I have is to pray to cultivate patience everyday — several times, if needed!! This month I really wanted to simplify my tending list and focus on a few goals. I want to help my husband with the garden, start running, read a book, and develop a morning routine. Thank you for sharing your goals and progress! I am so glad I found powersheets! 1) Read Cultivate! I’m on chapter 6 and am just loving it so far. Thank you for writing it and sharing it with all of us! 2) Stay creative. I’ve felt very much in a rut creatively lately and I want to start fresh and find new tools to keep my creativity inspired and create new things. 3) Pray without ceasing. I have been very lazy with my prayers and the results show in my life. I started a prayer journal last month and it helped, but I really want to double down on my focus with it this month.